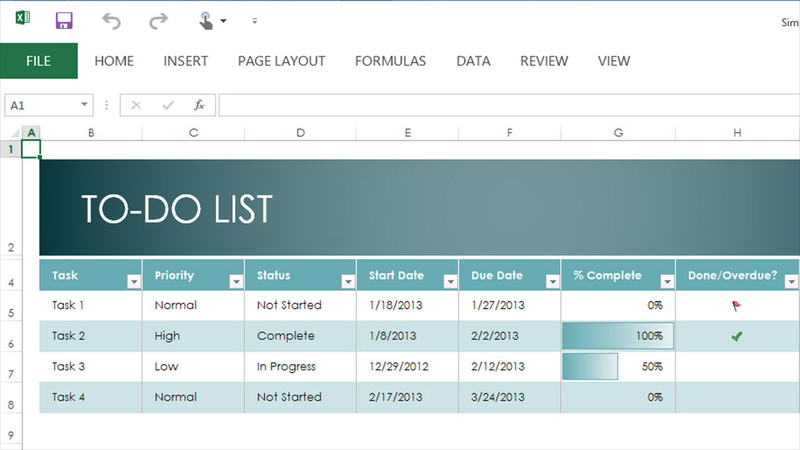 Microsoft's Office 2013 apps, like Excel, finally have a modern design and clean user interface. Office productivity suites -- word processing, spreadsheets, presentations, databases and so on -- reached their platonic ideal more than a decade ago. None are in need of any radical reinvention. That's why Microsoft has been content to incrementally update Office every couple of years. It makes sure its applications run smoothly, folds in the latest tech standards, and mostly leaves things alone. Now, though, it's facing an existential threat: Google Docs, a free suite that replicates most, if not quite all, of Microsoft Office's functionality. With Office 2013, Microsoft (MSFT) has to prove that its standalone applications are still worth paying for. It focused its efforts in two key areas: a substantial user-interface redesign, and adding Internet services through its "Office 365" package. Improved looks, improved handling: Office was one of the last holdouts in Microsoft's crusade to bring its products into the 21st century, design-wise. Like Xbox 360, Windows 8 and Windows Phone 8, Microsoft Office now looks -- finally -- about as good as you can make a productivity suite look in 2013. The texture-free graphics and stark contrast between colors makes it easier to navigate through the various interfaces of Office's different apps. There are a few places where the new design seems like a hindrance, like the "File" drop-down menu that takes you to a whole new screen. That's an exception, though: Most of the changes streamline the Office experience. Microsoft's attempt to make Office 2013 touch-friendly involved minor tinkering. Everything is a little more spaced out, which makes it easier to edit with your fingers. It works very well in some places, like highlighting cells in Excel or editing PowerPoint slides. That said, this isn't a touchscreen revolution. Office 2013 is still best experienced with a physical keyboard and mouse. One area where design seems to have gotten away from Microsoft is Outlook. Microsoft took a stab at a revamp, but the result is just as cluttered and busy as ever. The software has a more minimal look, but the lack of strong visual separation between panes and buttons makes everything feel incohesive and jumbled. Office anywhere: The main functional improvements in Office 2013 come through Microsoft's new "Office 365" subscription service, which costs $100 per year. In a nutshell, it turns Office into an Internet-connected app, allowing you save documents in the cloud, collaborate with others, receive regular software updates, and use a remote version of Office from any computer if you're in a pinch. The beauty of Office 365 is that it isn't a completely separate piece of software. Its features are integrated straight into the same software that non-365 users have. When you want to save a Word document to the cloud, the menu prompt sits right beside the option to save locally. If you're working on a spreadsheet with someone else, a little "refresh" graphic pops up over the save icon to let you know that changes have been made. It's an experience that's mostly seamless -- but with room for improvement. Collaborative document editing, for example, doesn't pop up on screen in real-time as it does with Google Docs; changes only reveal themselves when you save or refresh. That minimizes distractions, but when you're working with collaborators, real-time updates are far more efficient. Office 365 also offers a new feature called "Office on Demand" that lets you tap into Office even if you're working on a machine that doesn't have it installed. Go to Microsoft's Office website, launch Office 365, and a little applet acts as a terminal between you and an Office version running on Microsoft's servers. This is strictly for emergencies, though. Right now it's simply too laggy to use for any extended period without wanting to pull your hair out. Should you buy it? Office 2013 and Office 365 are a clear improvement over previous iterations. All the core aspects function as advertised, and there's no major product flaw or shortcoming that should stop anyone from using the software. But there's a larger question here about who Microsoft Office 2013 and Office 365 are really for. Some students and professionals actually need all the bells and whistles. For small businesses, the free software upgrades and simplicity of having all users on a standard, shared apps suite make Office 365 an appealing option. But for the person who doesn't need cloud support and just wants to print up a garage sale flier, or share a spreadsheet for managing the family finances, online services like the very good (and very free) Google Docs work just fine. An existing copy of Microsoft Office -- even one that's years out of date -- will also get the job done. We all use word processors and spreadsheets in our day-to-day lives, but most of us don't need all the rich formatting options, plug-ins and cloud services that Office 2013 and Office 365 provide. Not for the $140 price tag (for Office 2013's most basic version) or $100 a year subscription fee (for Office 365) that Microsoft is charging. This is one upgrade most of us can afford to skip.